This 2007 thriller stars Naomi Watts as Anna and Tim Roth as George, a loving married couple with a young son named George Jnr (Devon Gearhart). Deciding to spend some time at their palatial holiday house, their perfect getaway is soon about to receive a rude awakening. After briefly stopping at their neighbors, asking for assistance with their boat, a strange young man with white gloves is also present. Strangely enough, their son questions the behavior of their neighbor Fred who seems quite aloof, only to be dismissed by his parents. Later that day, a quiet young man named Peter (Brady Corbet) arrives at their home, asking for eggs which erupts into a deadly game, when his friend Paul (Pitt) arrives. 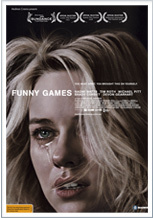 After a violent confrontation with George, the strange young men make a bet with the couple and their son, that they will die before 9am tomorrow and from there, the nightmare of Funny Games begins. Funny Games is not your standard thriller, rather director Haneke creates an off the beaten track thriller that will have you guessing till the end as plotlines are setup, only to be thwarted by the director. It's a very disturbing, dark and depressing thriller that we could happily recommend to those who love dark and unexpectable thrillers, however be warned, for this is not your Hollywood movie.